Our uniform is strict, smart and business like. Black Academy blazer with integral Academy badge. Black trousers, classic cut, with the waistband worn at the waist. Plain white traditional collared shirt – worn tucked in at all times. School tie with Academy badge. Tied with small knot and Academy badge shown in full. Top button done up and tie worn to the waistband. Black v-neck jumper with blue stripe on v-neck. No hoodies, cardigans, jumpers, sweatshirts, tracksuit tops, waistcoats, body warmers, denim jackets etc. are to be worn. Sensible, traditional, leather type shoes in black, with black stitching and black sole and heel. Trainers or trainer style shoes, Doc Martens, Vans, canvas type footwear, etc. are not allowed. Kickers are allowed but they must be plain black, with black stitching and black laces. Outdoor coats in a plain dark colour are preferable. Hoodies, denim and other products of fashion are not allowed (as above). 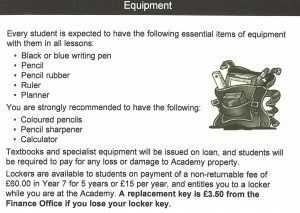 Jewellery and other forbidden items (e.g. mobiles used out of mobile zones) will be confiscated and only returned at the end of the day or half term for repeat offences. 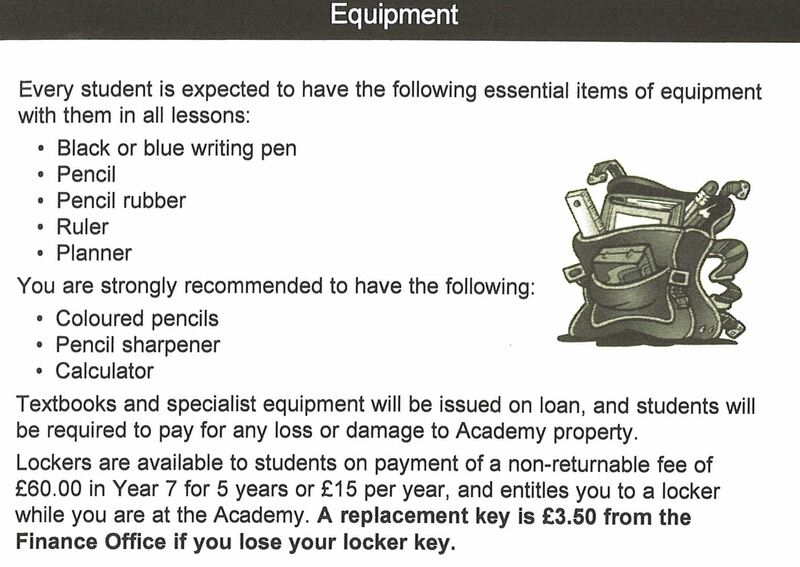 This may also lead to items only being returned to a parent/carer. Individual fashion statements such as extreme hair styles or colours are not permitted. Tram-lines, or other shaved designs or lines in the hair or eyebrows are not permitted; Grade 2 is the shortest length of hair allowed; bandannas, hoods, caps or hats are not permitted. Tinted or cosmetic contact lenses and decorative dental wear are not permitted. No jewellery except for one wrist watch and a maximum of one small, plain stud earring in each ear. Facial studs, other forms of body piercing or visible tattoos are not permitted. No accessories are to be worn around the neck, wrists, ankles or attached to clothing. School kilt worn to the knee with waistband unrolled or black trousers, classic cut. Sensible, traditional, leather type shoes in black, with a low heel, with black stitching and black sole and heel. Trainers or trainer style shoes, Doc Martens, Vans, canvas type footwear, etc. are not allowed. Kickers are allowed but they must be plain black, with black stitching and black laces. Plain white, or black socks OR plain (not patterned) tights in neutral, or black. Socks of any kind cannot be worn over tights and footless tights or leggings are not allowed. Hair bands etc, if worn should be black, white or the Academy sky blue. No make-up for Years 7-9 with discreet make-up for Years 10 & 11. False eyelashes and/or eyelash extensions are not permitted at any time. Nail varnish, nail decoration or nail extensions must not be worn at any time. Head scarves should be plain black. Mobile ‘phones are not banned from the academy but must be switched off and kept out of sight during lessons and when students move about the corridors – this includes headphones. 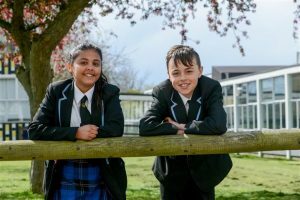 Students may use their ‘phones in designated areas at break and lunch time. Any ‘phone seen by staff will be confiscated and the student’s parents/carers will be asked to collect it.